This section is from the book "Wild Flowers East Of The Rockies", by Chester A. Reed. Also available from Amazon: Wild Flowers East Of The Rockies. This lily has the misfortune of being closely related to and associated with the Water Lily, one of our most beautiful, most fragrant, and most prized wild flowers. It is another case of "comparisons are odious," and the yellow lily suffers in consequence. It is, however, not unattractive and is interesting in its make-up. The leaves are thick, rough, ovate, slit or lobed to the stem, which is long and hollow. The flower is raised above the surface of the water on a long hollow stem. What appear to be six large green and yellow petals are in reality sepals; the real petals are numerous, stamen-like, inserted with the very numerous stamens under the golden-yellow rayed disk that forms the stigma. A. Cow Lily; Yellow Pond Lily. 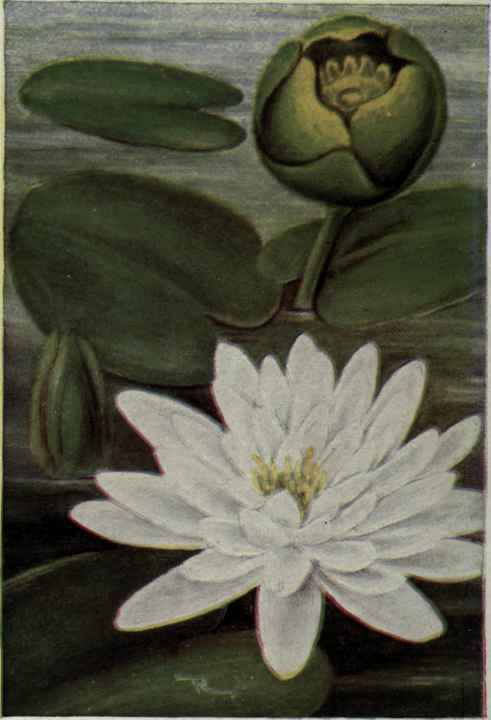 The Cow Lily is very common in still or stagnant water, often growing so profusely that passage in boats is almost impossible. It is found throughout the United States and southern Canada. Water Lily; Water Nymph (Castalia Odorata) needs no introduction to our readers. To my mind, it leads all other flowers in beauty, grace, purity and fragrance. It is composed of four sepals, greenish on the outside and whitish within, and numerous pure, waxy-white petals; the golden-yellow stamens, and anthers mature later than the radiating central stigma. The flowers open soon after sunrise and close shortly after noon; they sometimes are gigantic in size, often spreading five or six inches across. It flowers from June to Sept. in ponds or slow-moving water, everywhere; in ponds near the coast, we find a variety (roseae) that has pink or bright pink-red flowers. The rounded, lobed, long-stemmed leaves are pinkish beneath.